I miss this salty guy. He needs some love. Some salty love. A bit disappointed that they didn't make a Reynad reference, at least in the flavor text. Check that Golden! 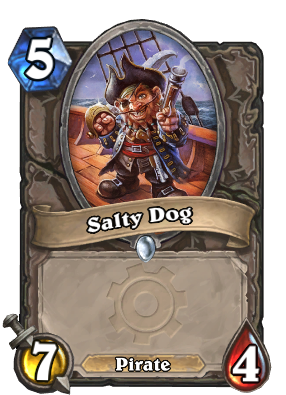 Pirate mayhem inc.
Not very good: It's simply a yarrrling Stalagg without an effect. Maybe good in Arena, but with 4 life he is too squishy to stay alive. Blizzard saw this post and wanted to spite you with Golakka Crawler. It actually passes vanilla stats test. And it's a Pirate. Of course, it would be better as a 6/5 but it's not bad. I think your vanilla is spoiled. The vanilla stats test is the sum of attack and health should be at least equal to twice the mana cost. Therefore, a 5-mana minion should have at least 10 stat points. 7+4 = 11, so it does pretty well on the vanilla test. The vanilla test is not a great measure of a card's power, just a rough guide. I agree 7/4 is not very good stats for a 5-mana minion. The vanilla test establishes the baseline stats for minions at that mana cost. Yes, Chillwind Yeti and Boulderfist Ogre have stats over the baseline, but only because they don't have any text; their extra points are not typical of minions at that mana cost because most minions have text. That's why they're considered over the baseline rather than being the baseline. The extra point is just a way to make up for the lack of other attributes. Maybe, but I didn't make up the vanilla test, so even if I thought your way makes more sense, it still wouldn't be the vanilla test.